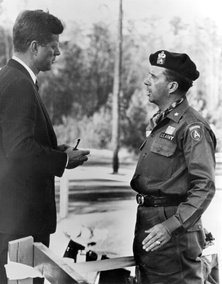 JFK was at Ft. Bragg in North Carolina, where he met with Brigadier General William P. Yarborough and toured the US Army Special Warfare Center. Impressed by the demonstration of military prowess he saw that day, shortly thereafter Kennedy authorized the “Green Beret” as the official headgear to be worn by the Army commandos. The challenge of this old but new form of operations is a real one and I know that you and the members of your Command will carry on for us and the free world in a manner which is both worthy and inspiring. I am sure the Green Beret will be a mark of distinction in the trying times ahead. Kennedy also made remarks to the 82nd Airborne Division stationed at Ft. Bragg.